The holy eyes of the Chazon Ish… Who can fathom such kedusha? Rav Shraga Feivel Steinberg used to take a walk with the tzaddik early in the morning when it was still dark outside. Bnei Brak in those days wasn’t very populated, and at that hour there was hardly anyone in the street. Nevertheless, the Chazon Ish would remove his glasses before the stroll to guard against seeing anything forbidden. That the Chazon Ish was so careful with his shemiras einayim is not surprising, but the second part of this anecdote is an eye-opener. One day, Rav Shraga Feivel noticed that the tzaddik started wearing his glasses during the walk. When he asked him about the change of minhag, the Chazon Ish answered that he thought it over and decided that it was better for him to keep his glasses on, for maybe a person will pass him in the street and greet him with a “good morning.” Without his glasses, he will not notice him or answer his greeting, causing the man to feel bad. Hence he decided to give up his minhag. A talmid of Rav Steinberg pointed out that we learn two things from this. Firstly, we see how important it is to guard one’s eyes. Even when it was still dark outside, with hardly anyone in the street, the Chazon Ish was careful not to look around freely. Secondly, as important as it was to the Chazon Ish to maintain the purity of his eyes, he yielded on his minhag because of his great sensitivity not to hurt someone’s feelings. For “its ways are ways of pleasantness and all its pathways are peace” (Mishlei 3:17). One of the blessings that Yaakov gave to Yehuda is “chalili einayim miyayin ul’even shinayim meicholov – His eyes will be reddened from wine and his teeth whitened with milk” (Bereishis 49:12). Rav Yochanan darshened from this posuk, “Greater is the person who whitens his teeth to his friend by smiling at him than the one who pours him milk” (Kesubos 111b). Imagine, said the Alter of Slabodka, that it is bitterly cold outside with a bone-chilling wind and you see a man pouring hot drinks to passersby to warm them up a bit, or pouring cold drinks on a sizzling hot day to quench their thirst. We would be amazed by this thoughtful chesed. How caring and dedicated he is to his fellow man. Greater than this, says Rav Yochanan, is one who whitens his teeth by smiling at others. Why is this a greater chesed? The Maharal explains that a cup of milk or tea is pleasurable for the moment, but after it is consumed, the pleasure quickly fades. A smile, however, remains with a person for a long time. It can cheer him up and brighten his entire day. The Alter said that we can easily reach this level of chesed and we don’t have to spend money buying drinks and carrying around large thermoses and cups. All we have to do is crack a smile and display it to people. How powerful that smile is. Because of that Yid, generations will be walking on the straight path. Switzerland was not very friendly to the Jews during World War II. They turned away over eighty percent of Jews trying to flee and enter their borders. Many of those who did succeed in entering their country illegally were deported to the Nazi-sympathizing Vichy government in France. But there were individuals amongst the Swiss who were sympathetic to our plight and did help save Jews. One of them was a police chief in Basel who eventually lost his job because he saved Yidden. He said that he had a special affinity for Jews because of the rov of Basel, Rabbi Arthur (Osher Michoel) Kohn, my wife’s great-grandfather. Every time he would pass him on the street – you guessed it – he would greet him with a happy demeanor. How many worlds were saved because of a smile? In fact, an integral part of Jewish history was shaped by a smile. When Yosef was in prison, he noticed one morning that the Sar Hamashkim and the Sar Ha’ofim were aggrieved. “And he asked Paroh’s couriers, who were with him in the ward of his master’s house, saying, ‘Why do you appear so downcast today’” (Bereishis 40:7)? Rabbeinu Bachya comments: The Torah tells us of the clothes of Yosef. Since he was together with those men in one group, in one ward, and in one house, he inquired about their matters and asked about their welfare. This is why the Torah mentions that they were “couriers of Paroh.” This tells us that even though they were wicked servants of a king without a yoke, he didn’t refrain from asking how they were doing. This is the way of mussar. We see that Yosef’s yeshuah stemmed from the fact that he asked about their welfare, because eventually the Sar Hamashkim mentioned him to Paroh and he was thus taken out of prison. The Torah teaches us that even though it seems like a small thing in the eyes of people, it is considered of great significance in heaven when one asks about another’s welfare, for it brings shalom to the world. As a result of all of this, Yosef was empowered to pave the way for his brethren to be able to survive in Golus Mitzrayim (Tiferes Elimelech). It is most interesting that Boaz, the forbear of malchus, hailing from shevet Yehuda and the great-grandfather of Dovid Hamelech, was the one who instituted the minhag of greeting a friend with the name of Hashem. He did this because during the period of the shoftim, the people were forgetting about the presence of Hashem in their daily lives, so a simple greeting of a friend with the name of Hashem would remind him. Rav Yitzchok Hutner zt”l, rosh yeshiva of Yeshivas Rabbeinu Chaim Berlin, offered a keen insight into this takanah of Boaz. The Rambam says about the melech Yisroel that “his heart is the heart of the entire nation.” He has a special connection to every individual in Klal Yisroel. Boaz had those special characteristics of a melech within him and felt that special association with every Jew. He had immense pleasure when meeting another Yid. Thus, the mentioning of Hashem’s name was tantamount to reciting a birchas hanehenin, a blessing made when experiencing enjoyment. This could also be the reason why greeting a friend with a smile is alluded to in the brocha of Yehuda, for this is a special middah of royalty, feeling an affinity with every single Yid. All Jews are considered sons of kings, and we, too, must emulate this middah of royalty. It is such an easy mitzvah to fulfill, and in the process you can really make someone’s day with a smile. There are so many in the world today who scowl at us and hate us with a passion. 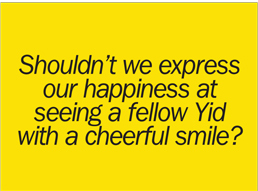 Shouldn’t we express our happiness at seeing a fellow Yid with a cheerful smile? The Gemara darshens from the words “chalili einayim miyayin” that Knesses Yisroel says to Hakadosh Boruch Hu, “Choch li einayim, gesture to me with your eyes, and that is sweeter to me than wine. Ul’even shinayim, please whiten your teeth, smile at me, for that is tastier to me than milk.” Oh, how we yearn to see a smile from the Ribono Shel Olam in this dark and bitter golus. How that would strengthen us in this harsh world. Perhaps if we learn to smile at each other, then, middah keneged middah, we will merit to experience the smile of Hakadosh Boruch Hu.